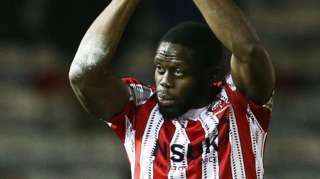 John Akinde scores a stoppage-time equaliser as League Two leaders Lincoln grab a draw against Exeter at Sincil Bank. 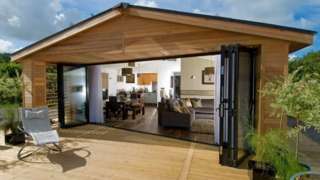 Luxury lodge holiday parks across England are rescued from administration. 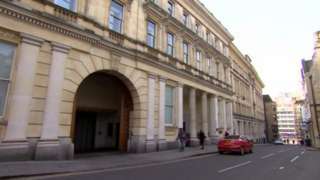 When a passer-by found her, the young victim repeatedly said she had been strangled, the jury hears. Devon both ways severe roadworks, between Dartmouth and Kingswear. Devon - Vehicle ferry not operating on Dartmouth Higher Ferry in both directions between the Dartmouth junction and the Kingswear junction, because of maintenance work. 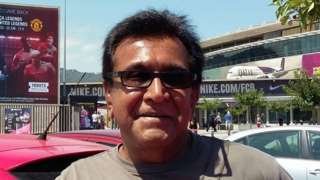 Natu Dhanji from Surrey said he had never been to Cornwall, where he was accused of failing to pay rates. A photograph of a shoal of mackerel caught out by the spring low tide in St Ives harbour, Cornwall, has won an underwater photography award. Victoria Walker's wide-angle shot came first in the "British Water Living Together" category of the 2019 Underwater Photographer of the Year awards. Impressive images have emerged of jetsurfers taking on the famous Cribbar wave in Newquay at the weekend. Jeff Scott, pictured here with Louis Allen, told us it was "absolutely amazing" riding the enormous swell on Friday and "a dream come true". He made a 12 hour round-trip from Eastbourne, Sussex, to experience the Cribbar on a motorized board. "The conditions were really good with the temperature, sun, the size of the swell and the wind direction," he said. "There was a lot of wind; which made the wave faces choppy and made it really difficult for the few guys who were paddling into the wave, so a massive respect to them for their commitment," he added. Two derelict sites in Ilfracombe could be compulsorily purchased by a local council to try and speed up their redevelopment. Fire destroyed both the former Golden Coast amusement arcade on the seafront in 2004 and the Montebello Hotel on Fore Street (pictured) in 2006. Both are having an adverse impact on the town's environment, economy and the wellbeing of the community, according to a new report. North Devon Council said that, without intervention, both sites were likely to remain in their current state. The proposals will be discussed in a council meeting in March. Councillors are being given the option to set a lower increase in fees paid by Plymouth taxi drivers after an outcry at the size of a planned hike. In mid-January the city council published a draft set of new fees for hackney carriage and private hire drivers which in some cases had gone up by more than 80%. The size of the increase led to noisy protests by taxi drivers who twice drove in convoy through the city centre to highlight their opposition to the changes. For hackney drivers, it was proposed that a one-year black cab licence would go from £210 to £342 and a one-year driver’s licence from £112 to £165. A one-year private hire vehicle licence would have gone from £117 to £170, with a one-year driver’s licence going from £82 to £120. There were 82 objections to the original proposals published for consultation in mid-January, with most response saying they were too high, a report to the taxi sub-committee said. Now officers have come up with alternative proposals, which would see a hackney carriage one-year vehicle licence go from £210 to £300, with a one-year driver’s licence up from £112 to £130. A one-year licence for a private hire vehicle would rise from £117 to £145, with a one-year driver’s licence up from £82 to £110 instead of £120. The two options will be considered by councillors on the taxi licensing sub-committee on Thursday. A tractor has been stolen near Hayle, police have said. The green and yellow John Deere 6520SE vehicle was stolen from Gwinear between 22:00 on Friday 22 February and 07:00 on Saturday 23 February. A new supermarket, a medical centre and industrial units have all been scrapped from major development plans in Hatherleigh. Kingswood Homes has revised its scheme with the changes also including a reduction in the number of homes from 123 to 102, the relocation of the market square, and a significant increase in car parking from their original proposals submitted in 2018. The changes followed concern over the amount of noise and odour from an adjacent abattoir site, comments from residents that the amount of housing was too high, and that there was no appetite for a supermarket to be provided. West Devon Borough Council planners will decide on the fate of the application at a later date. He was "ashamed" of being off with stress and a note found after his death apologised to his patients. Crownhill Road in Plymouth should "reopen by this evening", Wales and West Utilities has said. The road is currently closed at the junction of Transit Way due to gas leak repair works. The organisation said it's a "complicated" job but engineers will be "working around the clock to resolve this issue as safely and as quickly as possible". M5 Devon southbound severe disruption, at J27 for A361. M5 Devon - M5 exit slip road partially blocked southbound at J27, A361 (Tiverton), because of a broken down vehicle. Traffic is coping well. 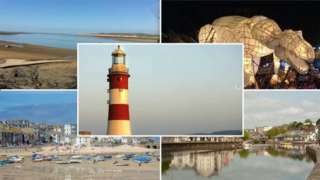 A Paignton resident has said he considers part of the tourist town a no-go area at night. Nigel Penny highlighted his concerns about violent crime in the resort at a meeting of Torbay Council, citing recent robberies at a betting shop, a supermarket, and an alleged knife attack. 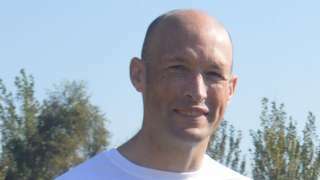 Mr Penny said police had responded promptly to incidents he referred to, but added there were "places now in Paignton I think twice before I walk, and I will now not walk when with my wife at night in the winter". Councillor Robert Excell, who represents the authority on the Devon & Cornwall Crime Panel, said more police resources were being given to Torbay. There were eight PCSOs in Paignton and Brixham, with a further 10 in Torquay and two more to be recruited, and the area had a new police basic command unit, the meeting was told. The new unit was created last year for Torbay and South Devon under the command of a chief superintendent. A 13-year-old boy has gone missing from Exeter and police are concerned for his welfare. Jayden Hocking was last seen in the city at about 13:20. He is described as white, 6ft 1in (1.85m) in height, with blonde hair and wearing a blue jacket, grey jogging bottoms and black shoes. A man was taken to hospital with a head injury after being assaulted with a glass bottle in Plymouth, police have said. Officers were called to Western Approach car park at about 10:50 - where the offender was located on the roof. The 26-year-old man was talked down and arrested on suspicion of causing actual bodily harm and assaulting a police officer. The victim's injuries are not thought to be serious, Devon and Cornwall Police added.